Blues For Lester is an extended piece with an eclectic blend of jazz (with a touch of Monk), funk, contemporary classical, and blues. 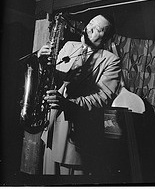 It is an expression of my admiration for Lester Young, the great tenor saxophonist, who had many quirky qualities in his music. Recorded by David Arivett. This piece draws upon aspects of Lester Young's playing that I admire and have internalized: His horizontal approach to harmony, how he played around with time in his phrasing, used "wrong" notes (from a vertical chord perspective) at times, and had an audacious sense of humor. They are expressed in Blues For Lester in my own style. After the solo section there is a free-improv interlude for the bass (not included on the recording) that leads into a 32-bar ensemble chorus. The chorus, starting on page 7 of the score, uses phrases from several Lester Young solos (thanks to Tim Price for the transcriptions) that are compositionally stitched together. The chorus starts at the bottom of the ensemble and progressively works its way up through the instruments to a full-ensemble passage with open harmonic voicings and linear writing.